New from Battlefield Legends! Paragon dismounted 7th Cavalry troopers fighting on foot and cast in classic powder blue. 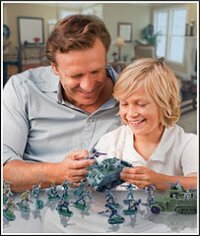 Includes twelve (12) beautifully sculpted and highly detailed 54mm plastic figures in six (6) poses. 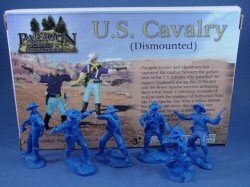 This set makes a wonderful addition to any toy soldiers collection or "Custer's Last Stand" diorama. See the entire line of new Paragon 7th Cavalry troopers and Apache Indians in stock now.